The Republic Day 2015 has quite a few firsts to its credit. For the first time in 66 years a serving US President was the Chief Guest at this important public event. And for the first time too significant political and economic agreements were signed, particularly the agreement on Civil Nuclear Deal. Let us put all this in perspective. A year ago, no one in India would have deemed it possible for a US President to be the Chief Guest on the occasion of the Republic Day. The commentators here have simplified the whole issue into one of "chemistry" between the two leaders. Nothing can be more wrong than this. USA has finally realized that India has changed and it is no longer possible to ignore India. The fact that USA was used to equating Indian concerns with Pakistan's sensitivities was the crux of the whole relationship, India was usually hyphenated with Pakistan. For the first time the joint statement issued after the talks made an unequivocal commitment to end terrorism and in the usual diplomatic parlance took a firm step towards ensuring that the 26/11 suspects are brought to book. I think this shift in US policy in the most important outcome of the visit. The Civil Nuclear deal between India and USA was signed sis years back and there was little progress on the issue because of the "liability" clause in the Act passed by the Indian Parliament. The legality of the liability clause can be debated but the fact is that the BJP insisted that the clause which makes the supplier and not the operators of the power plants liable for the cost of any accident. The US power industry was naturally apprehensive about this clause and Modi was able to talk the US President into using his executive powers to iron out the differences. I think this is again a huge shift in US position. The fact that a Democrat has been able to muster the political will to make a huge shift in India's favor is a sign that Indo-US Relations are improving. I am personally in favor of a more even handed approach so that the Chinese Government does not get too highly perturbed over the growing ties between the two countries. However, the deal was struck within 7 months of Modi coming to power and this goes to show that in the domain of foreign policy Narendar Modi has rare grit and talent. The other important takeaway from the visit of Barack Obama is the US endorsement of the "Make in India" campaign launched by Narendar Modi. The long and dreary years of Congress rule staring with Jawaharlal Nehru saw India adopting a model of development which was based on the importation of technology in the knocked down version and the factories reassembled in India. The Ambassador car is a good example of this. Reassembly of kits, manufacturing on the basis of expired patents or process innovation were the hall marks of Indian industrialization. And this charade was called "thrust toward self sufficiency". Rightly has India rejected this model of development and Modi in his Make in India Campaign seeks transfer of technology, partnership and skill development all of which were absent in the Nehruvian model. The Make in India campaign figured prominently in the Davos Meet. The recent comments in China in which the Obama visit was sought to be downplayed has to be viewed seriously. China has very perceptively understood that there is a major shift in the very principles of Indian foreign policy. I am sure that Narendar Modi during his forthcoming visit to China will reassure China that Indo-US relations are not directed at China and so far Narendar Modi has sent out all the right messages. 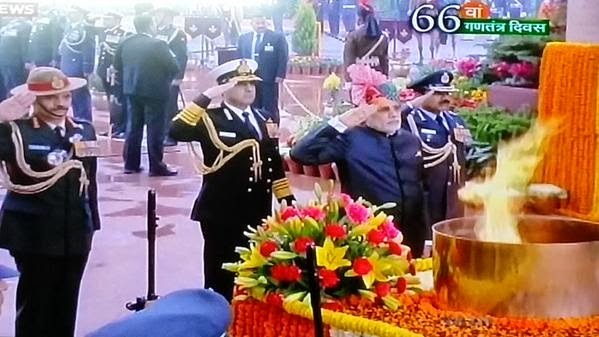 The Republic Day began with Narendar Modi paying tribute to the Indian Army at India Gate which was built by the British to honour the war dead of India in the Great War, 1914-18. Obama's Sisri Auditorium Address and later comments on "Religious Freedoms in India" have caused some concern in India. Given the state of play ion the uSA about race relations and the repeated killing of black men, if our Prime Minister makes a public statement to the effect that the mass incarceration of black youth, the killing of unarmed men in police encounters like the infamous Ferguson killing ect will shock Dr Martin Lutehr King. Such statements are cheap and demean both India and USA. I think Obama should not have uttered those ridiculous words as if he is the moral centre of this universe.